“Sticks and stones may break my bones, but words will never hurt me.” Regardless of this old adage, words have been used to initiate great harm across history and into our present day. As parents, we’re in a unique position to help our generation of children learn to not only “use your words” but use words designed to harness the power of deep connection, understanding, healing, and good. This month, October 1-31, Attachment Parenting International‘s 2017 Attachment Parenting (AP) Month theme centers around the reality that our words are powerful and most beneficial when we seek and use them to connect. Words fly around us in every medium imaginable and even visual media is translated into verbal and/or written expression. We swim in a great alphabet soup. How can we make it more nourishing for all of us — especially our children? “Watch your language” is a well-known parenting phrase we use to prevent our young children from hearing, parroting, or even intentionally using impolite or disrespectful words. Despite our best attempts, we’ve probably all felt — or will feel — embarrassed about something our child has said, especially when we know they learned it from us. “Word power” begins with a bang when our children turn 2, and their word of the year is “no,” which not coincidentally, mirrors our own word of the year. “Use your words” is what we say as we continue to guide our children between impulsive, full-body language to a more needs-based verbal language. Learning how to express feelings and ask for help and cooperation is a learning task that occupies parents and children across all of childhood and through life. Over time, our children won’t mimic us as directly as when they were 2, but they never stop absorbing what we say to them. They take our words deeply to heart and to the point that our words form the outlines of the fundamental belief system around which our children come to think of themselves. Our words matter a great deal to our children even when we’re not addressing them directly. When our children hear us speaking to and about others, they absorb this into their own repertoire without awareness. This type of knowledge transfer isn’t obvious teaching-learning, but we realize it happens when we hear echoes of it in their conversations and interactions with siblings, friends, and others. Sometimes we’ll find our own words directed back at us. Words constantly swirl around us in our adult world, and they have an impact on us as well. As adults, we have the ability to choose where we direct our attention, but it can still be challenging to select for connecting and uplifting messages. Negative news sells — that’s obvious. It’s also obvious how much easier it is to fill space with thoughtless, snarky rants and vents than to take time to write with civility, kindness, understanding, and empathy. When we aim to use and seek communication for connection, it makes a powerful difference in our mood and health. We reap benefits, but so do our children, families, friends, and others we encounter. This kind of “word power” helps provide us with a kind of superpower — it’s not just a protective shield, but a positive energy. This kind of “word power” is protective, but even better, it allows us to radiate positive and connective communications. 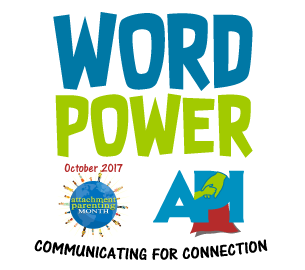 Join us this October as we use our superpower — “Word Power: Communicating for Connection” — to celebrate AP Month 2017. Read the research behind AP Month 2017 here.